A virtual sphere around you to help you track the things you care about and carry along. 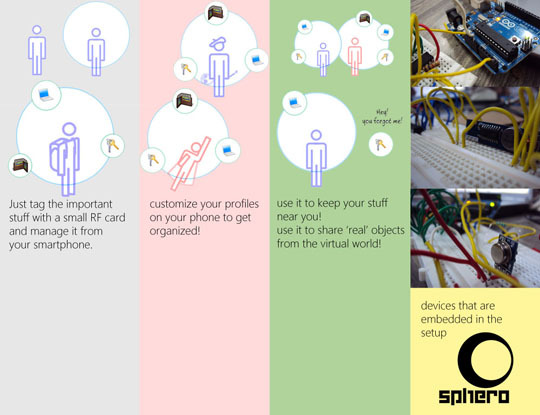 An arduino based smartphone application which ameliorates the concept of a human-centered virtual cloud sphere and keeps a track of things we care about. It allows tagging of your important stuff with help of RFID smard card stickers.If you accidentally move away from your stuff or the stuff moves away from you, it will notify on your smartphone using communication techniques provided by arduino. It also allows virtual social networking to share things with your friends in real life. This project was prototyped and developed at Design Innovation Workshop, Delhi conducted by MIT Media Lab.